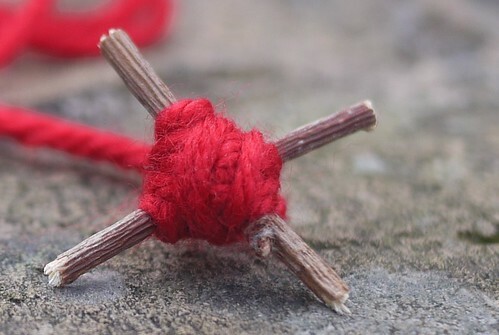 Hopefully I’ve given a good idea of the use of rowan in this article here, but on this page I’m aiming to outline a ritual for making the protective charm of rowan and red thread that are traditionally hung above the thresholds at festivals. The ritual, slightly adapted, is also given to make charms for travel. It is considered unlucky to cut or damage rowan trees in any way except “between the two Beltan days”1 (although there doesn’t seem to be anything similar with regards to collecting the berries in autumn), so it’s a good idea to collect branches that have fallen naturally or trim enough for the year ahead. Either way, I prefer to leave offerings and a few words of thanks when I’ve finished collecting the twigs I need. I’m of the opinion that while the cross form of the rowan charms are more than likely to be one of the later evolutions of the tradition, the four arms can be thought of as representing the four directions, and so represent an all encompassing protection. Alternatively, a twig wrapped in the thread, or peeled of bark and carved or decorated2 (perhaps with appropriate ogams) and hung by the thread, or a branch,3 could be used instead.4 Decorative beads (especially amber), dried rowan berries,5 and so on, could be added to the thread it will hang from if you wish. For the ritual you will need the rowan, thread, and something to cut them to size. You could also sprinkle a little silver’d water (see the Saining Ritual) over the charm once it has been hung, as you say the second verse. A charm between this house and harm. Small charms of rowan and red thread can be carried in the pocket or even sewn into clothes,7 or put in the car for protection, and so the verses can be adapted for purpose. These can be carried on a day to day basis, but may be particularly useful when going somewhere potentially dangerous, or during potentially dangerous times. A charm between ______ and harm. With the name of belovéd Bride on my lips. 1 Bennett, ‘From Local Memorate to Scottish Legend’, p179 in Fantastical Imaginations, edited by Lizanne Henderson, 2009. 2 Black, Scottish Charms and Amulets, 1892. 3 Black, Scottish Charms and Amulets, 1892. 4 Carmichael records that “an old man in Uist said that he used to swim to an islet in a lake in his neighbourhood for ivy, woodbine, and mountain ash. These, sometimes separately and sometimes combined, he twined into a three-plied ‘cuach’, ring, which he placed over the lintel of his cow-house and under the vessels in his milk-house, to safeguard his cows and his milk from witchcraft, evil eye, and murrain.” Carmina Gadelica Volume II, 1900, p280. 5 Maclagan, Evil Eye in the western Highlands, 1902, p114. 6 This charm is mostly of my own making, but takes some inspiration from Song 143 in Carmina Gadelica Volume II, 1900, p52-53. 7 Gregor, Notes on the Folk-Lore of the North East of Scotland, 1881, p188.